I seriously can't get over the fact that it's already mid July. Why of all seasons does this one fly by. Despite the pace, I'm trying to savor summer and make the most out of all my free time. Went whale watching through the San Juan Islands where I spotted a Minke Whale, but none of my beloved Orcas, and walked away with my first sunburn of the season. Attended a screening of Back to the Future al fresco at Fairhaven's Outdoor Cinema. Picked raspberries off the vine and I've been devouring as much local fruit as possible. Played a lackluster game of badminton. Went island hopping over to Vashon Island for the day. Then in two weeks I'll be jetting off to Savannah for my first "proper" vacation of the season. This girl needs to get out of dodge STAT. Then upon my return it's hopefully a mini roadtrip to Ashland, Oregon. The image above the recipe below make me happy beyond belief! 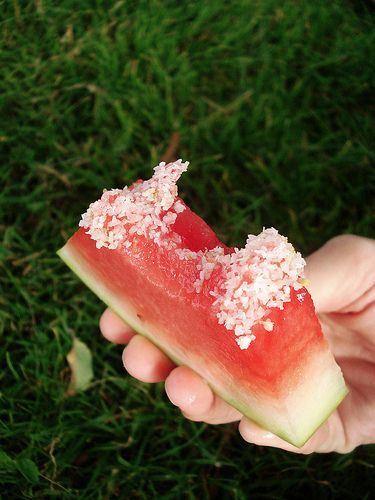 Use a small seedless watermelon, quartered and cut into 1-inch-thick wedges. Directions: Arrange watermelon in a single layer in two 9-by-13-inch baking dishes. Bring sugar and water to a boil in a small saucepan. Stir until sugar dissolves, about 1 minute. Let cool slightly. Stir in tequila and triple sec. Pour syrup over watermelon wedges, and refrigerate for at least 45 minutes. Remove watermelon from syrup, and arrange on a platter. Squeeze lime over the wedges and season with salt. June summed up in photographs via Instagram. I submitted a photograph to the Seattle Art Museum contest celebrating the exhibit "Future Beauty: 30 Years of Japanese Fashion" on a lark and was floored to be one of the semi-finalist. I'm now going to shamelessly ask that you vote for me (using this voting form). Plus, when you vote you will be entered to win four tickets to the exhibit, it's a win win. Thanks, you're the best!